Bacteria and fungi growing saprotrophically on damp surfaces in buildings, and in humidifiers and HVAC systems, contribute to the air spora of indoor air, which is dominated by the moulds Penicillium and Cladosporium and bacteria in the the Micrococcaceae. Actinomycetes and xerophilic fungi are among those micro-organisms in indoor air which are associated with rhinitis and asthma. Some organisms cause humidifier fever and extrinsic allergic alveolitis, but pathogens such as Aspergillus fumigatus and Legionella are seldom abundant. 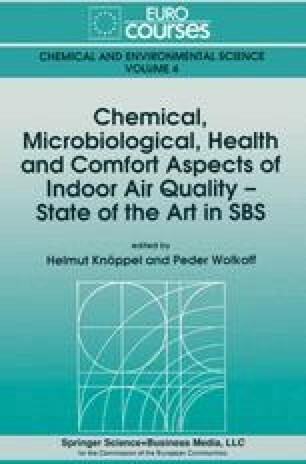 In investigating possible relationships between the air spora and symptoms of building-related illnesses such as SBS, the choice of sampling and cultural methods is critical. Although viable samplers make identification of organisms possible, they underestimate the total numbers of airborne spores and bacteria, but liquid impingers and filtration samplers enable viable counts and total counts to be made from the same sample. Since mycotoxins in inhaled fungal spores may seriously affect macrophage and other functions in the lung, more research on the effects of toxigenic fungi on respiratory health is required. Another area requiring investigation is production of microbial volatile compounds and their possible role in health.